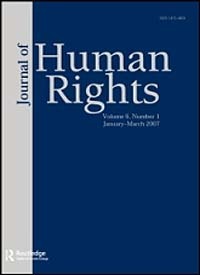 The HRI is happy to announce new publications by members of our leadership and also of our affiliated faculty in a special issue of the Journal of Human Rights (2013, Volume 12: Issue 1). HRI Assistant Professor in Residence Dr. Glenn Mitoma and HRI affiliated Professor at Bard College Dr. Kerry Bystrom are guest editors of an issue of the Journal of Human Rights devoted to Humanitarianism and Responsibility. Their article serves as an introduction to the articles in this special issue of the Journal of Human Rights on humanitarianism and responsibility. They thread the work of the contributors, along with other key scholars, together into a broader discussion about the possibilities and limitations of humanitarian responsibility. They first elaborate several constitutive dimensions of responsibility as it has been understood in humanitarian discourse, with particular attention to the way in which it has been deployed to both limit and extend the humanitarian mandate. Then they consider how the discourse of humanitarian responsibility constitutes a departure from, and a possible alternative to, the discourse of human rights as the reigning lingua franca in which ethical arguments are advanced at the global level. Ultimately, Mitoma and Bystrom contend that while renewed emphasis on responsibility is no panacea for the difficult political and ethical questions that bedevil international humanitarianism and should not displace the focus on human rights, the process of critically engaging with this term may present a valuable opportunity to rethink the pursuit of global justice as a situated and contingent engagement between the self and those distant and proximate others who are exposed to catastrophes, natural and man-made. Full citation: Journal of Human Rights, 12(1),(2013). Link to Journal-yet access to articles are available only when signed on to UConn Library system. Gilligan argues that through analyzing the various factors in R2P’s genesis and expansion as an international norm, her article contends that the office of the UN Secretary-General has provided steady backing of R2P, allowing for its ongoing consideration within the UN bureaucracy and among member states. In this respect, R2P has been able to assert itself in a meaningful way, with member states compelled to revisit the central tenets of the norm within the General Assembly and special dialogues. The office of the Secretary-General has clearly interpreted R2P as a strong and effective reinforcement of Article 1 of the UN Charter and the overall UN mandate, using the norm to more strongly anchor existing UN principles and values. Full citation: Journal of Human Rights, 12(1),(2013). Link to Journal-access to articles are available only when signed on to UConn Library system.